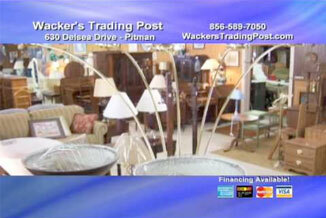 Wacker's Trading Post was established in 1947 and is conveniently located in Sewell, NJ. We have built a business on buying and selling used home furnishings and antiques with a unique twist. Over the years we have found some very unusual items. We have also added quite a few new furniture companies to compliment our used merchandise. Our buyer is out searching for the best quality/condition items every week. Check out our Used & Antique Gallery for the latest items. Sign up for Twitter and Text Alerts for new arrivals and specials.